NAVIO Surgical System is a robotics-assisted navigation technology to treat patients suffering from early to mid-stage osteoarthritis of the knee. Patients who’ve had knee operations using the NAVIO Surgery System experience less pain and post-operatively swelling than traditional total joint replacement methods. NAVIO Robotics is an advancement in the way orthopedic surgeons can perform partial knee replacements. 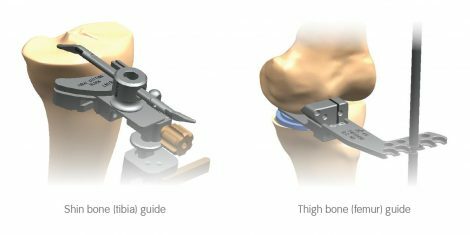 Using state-of-the-art, robotics-assisted technology, the system works with the surgeon’s skilled hands to achieve precise positioning of the knee implant for consistently accurate results. During the procedure, the surgeon uses NAVIO Robotics to collect anatomical data to build a 3D model of the patient’s knee. This information helps the surgeon place the implant and balance the knee’s ligaments for optimal alignment and a well-balanced knee. The process starts by focusing on the patient and planning a procedure with their unique anatomy in mind. Rather than a time-consuming and radiation-intensive CT scan, the NAVIO approach involves only a simple x-ray before the surgeon uses advanced planning software to tailor the surgery to the patient’s anatomy, align the implant, and balance the knee. Through an advanced computer program, the NAVIO system provides robotic assistance that relays precise information about your knee to a robotics-assisted handpiece used by our surgeons during the procedure. Less pain because there is less cutting of tissue (tissue dissection). More natural knee motion (kinematics). Outpatient surgery vs. hospital stay. A quicker return to an active lifestyle. Many patients are able to walk and climb stairs the same day of surgery and leave within 24 hours. Using the NAVIO assisted partial knee replacement, patients typically walk and climb stairs on the day of surgery and leave the hospital in 24 hrs. It helps patients return quickly to an active lifestyle. Traditional surgical methods use cutting blocks or guides to help direct a surgical saw in removing the diseased bone and cartilage – a method that is technically challenging. The use of robotics provides unmatched accuracy in bone preparation and implant positioning, where misalignment can be major contributor to implant failure. Accurate bone resurfacing (removing part of the bone and replacing it with a metal or ceramic cap). Greater consistency than with traditional instrumentation. No pre-operative imaging is required vs. using a computerized tomography (CT) scan, saving time and money. 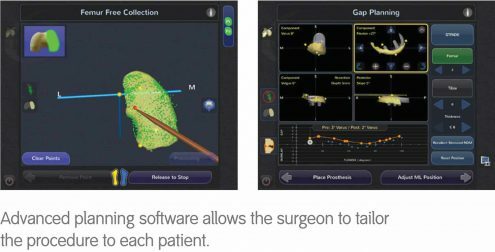 Customized patient-specific planning – Implant size and position determined virtually. AGE – The strongest risk factor for OA. OA can start in young adulthood – often due to joint injury. GENDER – OA affects both men and women. However, before age 45, OA occurs more frequently in men; after age 45, OA is more common in women. JOINT INJURY – Traumatic injury to a joint increases risk of developing OA. OBESITY – Chances of developing OA generally increase with the amount of weight the body’s joints have to bear. JOINT ALIGNMENT – People with joints that are not aligned correctly, like bowlegs, dislocated hips, or double-jointedness, are more likely to develop OA in those joints. 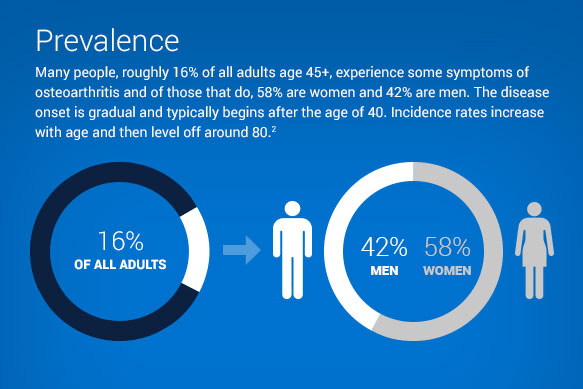 Many people, roughly 16% of all adults age 45+, experience some symptoms of osteoarthritis. Of those that do, 58% are women and 42% are men. The disease onset is gradual and typically begins after the age of 40. Incidence rates increase with age and the level off around 80. Osteoarthritis generally starts with pain that has developed gradually, with stiffness and swelling of the joint – most associated with activity. A doctor performs a physical examination that focuses on the patient’s walk, range of motion in the joint, and swelling or tenderness. Cartilage loss can be generally confirmed with X-rays that show a loss of cartilage in the affected knee. Osteoarthritis can be treated non-surgically, with drugs or with a variety of surgical treatment options. Nonsurgical options generally begin with lifestyle modification—losing weight, switching from running to lower impact exercises, and minimizing activities that may aggravate the patient’s condition. Physical therapy can help increase range of motion and flexibility in affected joints, and supportive devices like braces, canes and specialized shoes can assist with pain and weight-bearing issues. Certain anti-inflammatory and pain management medications drugs are available in treatment of OA. Recent advances in navigation and computer-assisted surgery (including robotic-assisted techniques) have gained traction by providing enhanced planning and accuracy. Partial Knee Replacement preserves all soft-tissue ligaments (ACL and PCL) while resurfacing only the diseased portions of the knee with artificial joints. A Total Knee Replacement sacrifices one or both of the ACL and PCL, removing all weight bearing surfaces of the knee and replacing it with an artificial joint. Arthroscopic Surgery using fiber-optic instruments enables the surgeon to see inside the joint to remove debris or repair torn cartilage. Michael A. Miranda, D.O., M.S. NAVIO is a trademark of Smith & Nephew. Learn more about the NAVIO robotics-assisted partial or total knee replacement by submitting the form below.